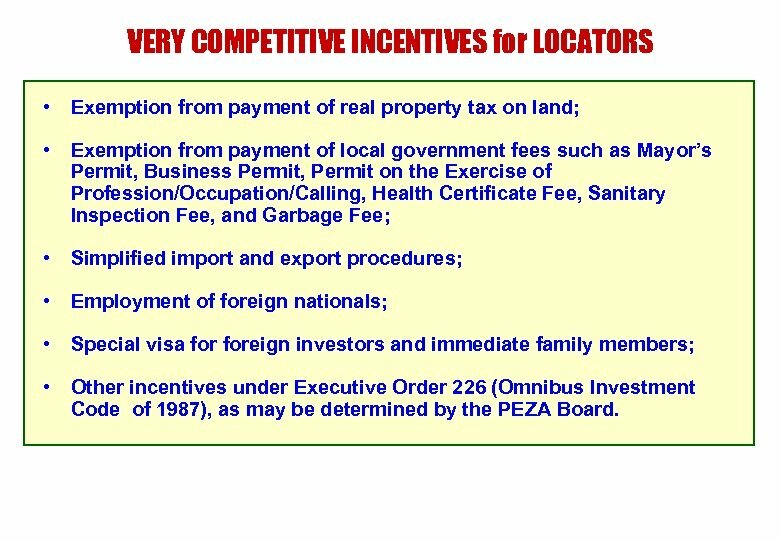 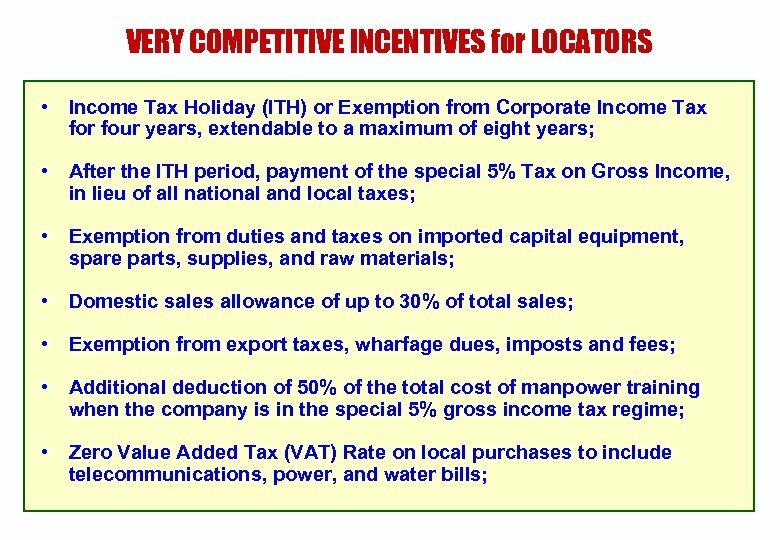 VERY COMPETITIVE INCENTIVES for LOCATORS • Exemption from payment of real property tax on land; • Exemption from payment of local government fees such as Mayor’s Permit, Business Permit, Permit on the Exercise of Profession/Occupation/Calling, Health Certificate Fee, Sanitary Inspection Fee, and Garbage Fee; • Simplified import and export procedures; • Employment of foreign nationals; • Special visa foreign investors and immediate family members; • Other incentives under Executive Order 226 (Omnibus Investment Code of 1987), as may be determined by the PEZA Board. 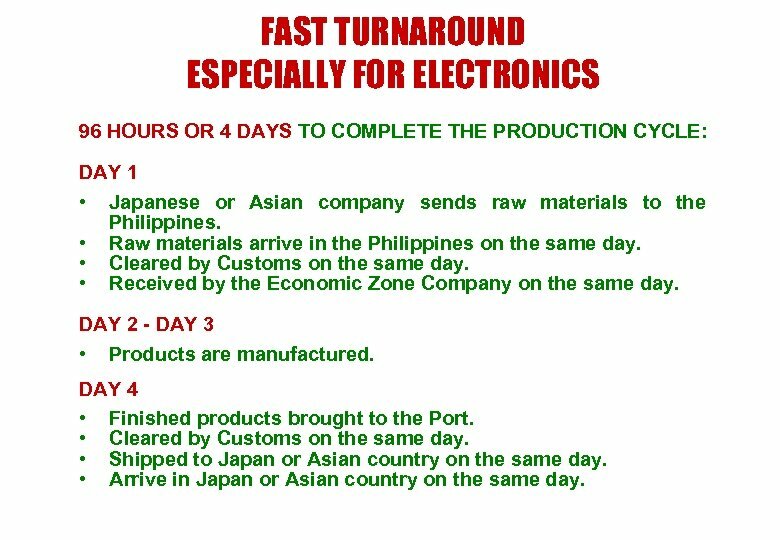 FAST TURNAROUND ESPECIALLY FOR ELECTRONICS 96 HOURS OR 4 DAYS TO COMPLETE THE PRODUCTION CYCLE: DAY 1 • Japanese or Asian company sends raw materials to the Philippines. 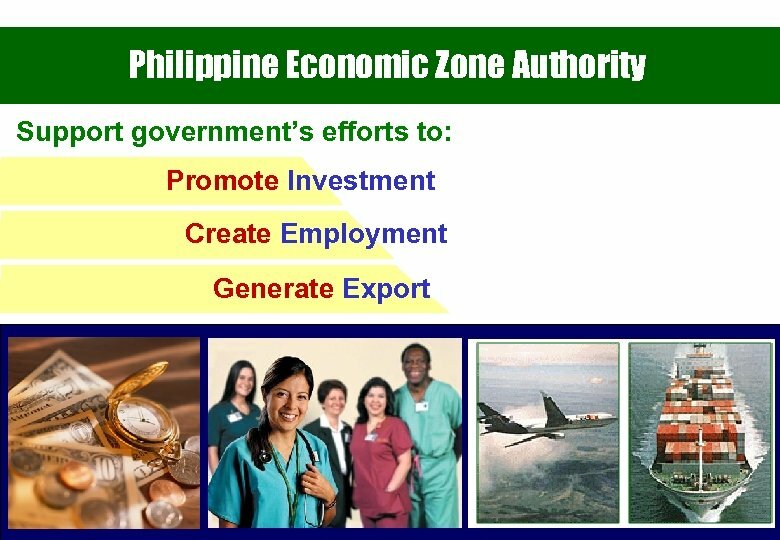 • Raw materials arrive in the Philippines on the same day. 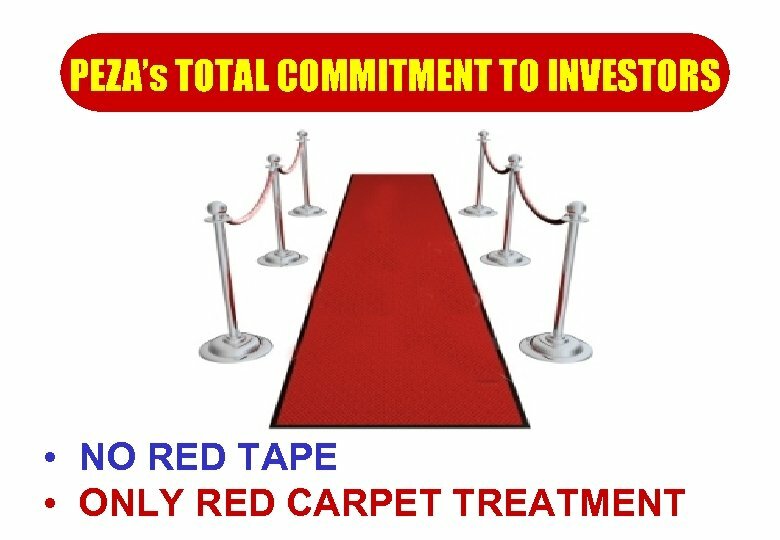 • Cleared by Customs on the same day. 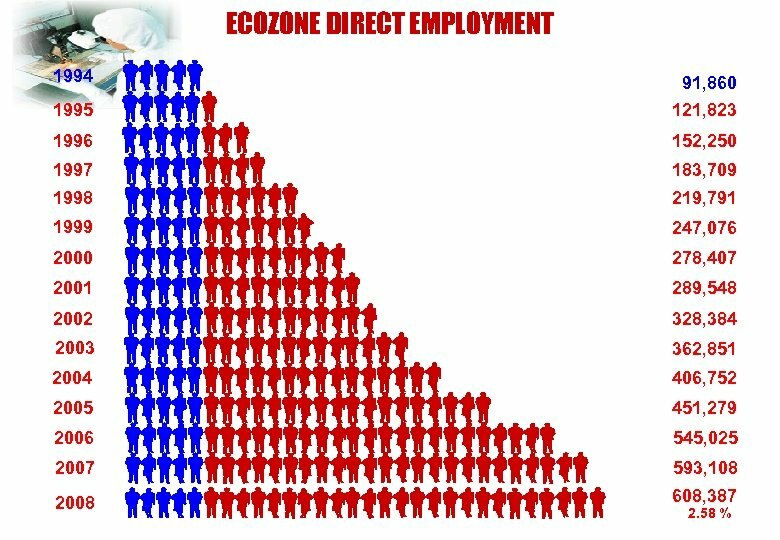 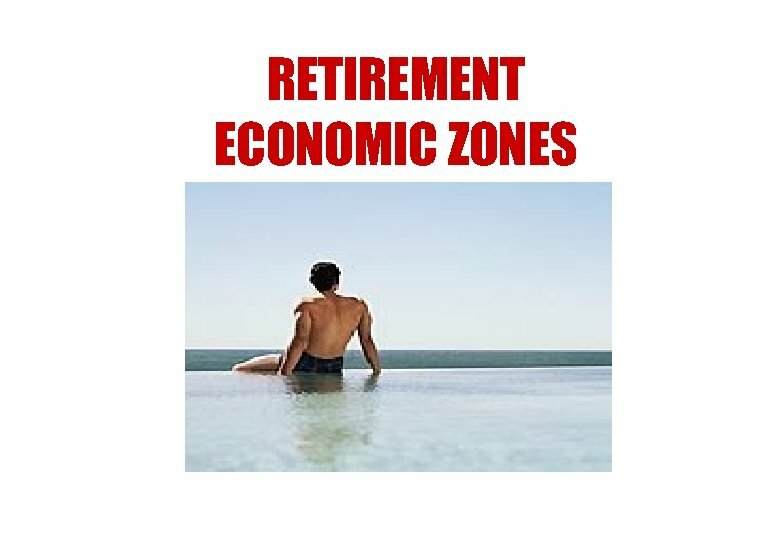 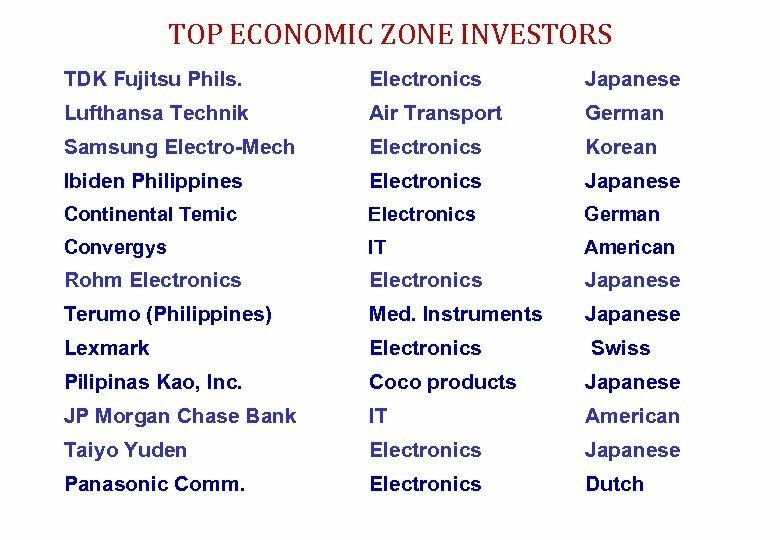 • Received by the Economic Zone Company on the same day. 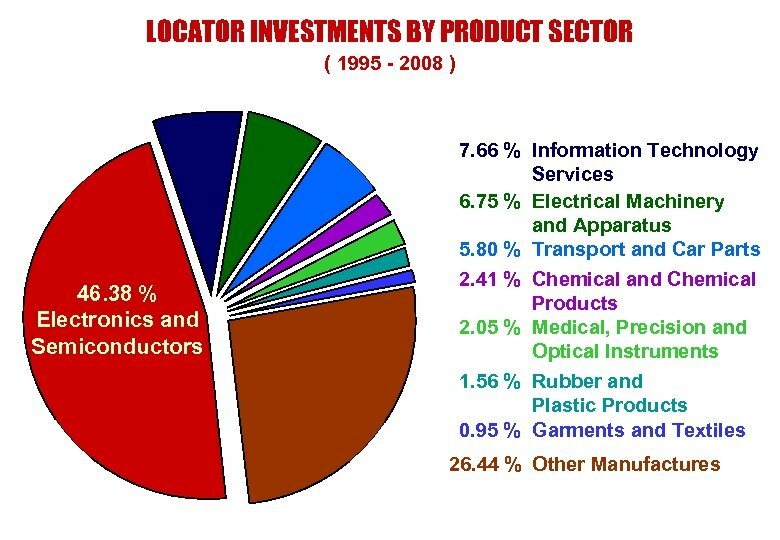 DAY 2 - DAY 3 • Products are manufactured. 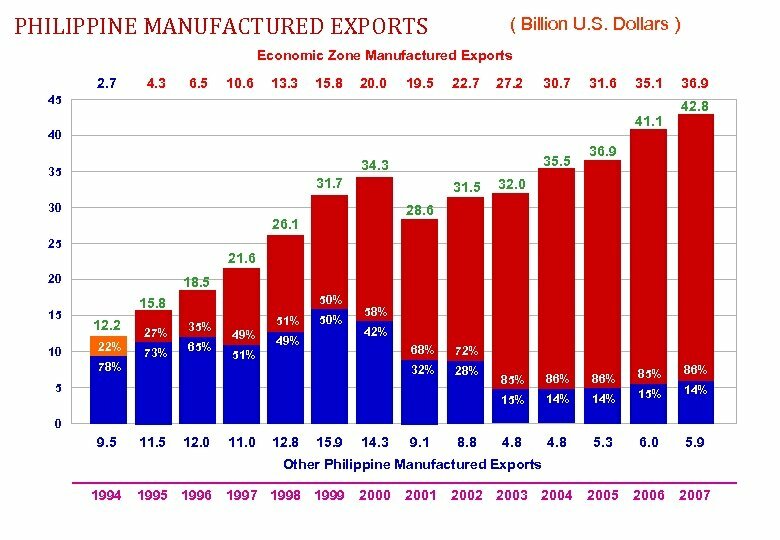 DAY 4 • Finished products brought to the Port. 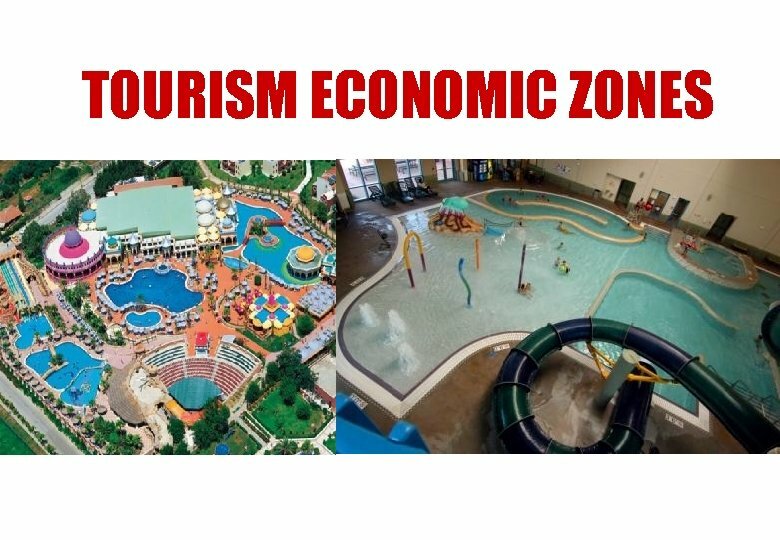 • Cleared by Customs on the same day. 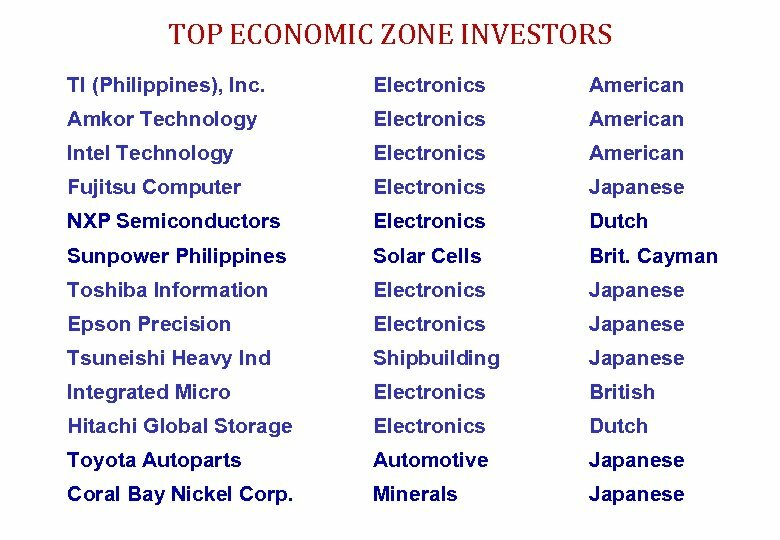 • Shipped to Japan or Asian country on the same day. 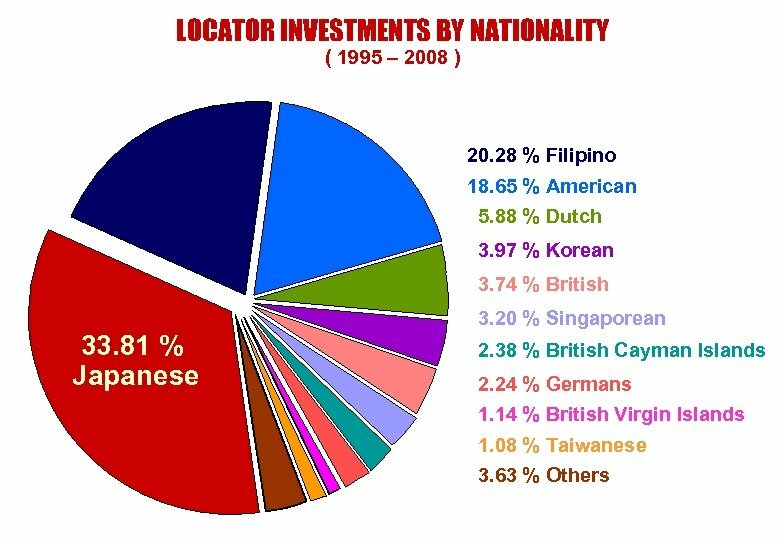 • Arrive in Japan or Asian country on the same day. 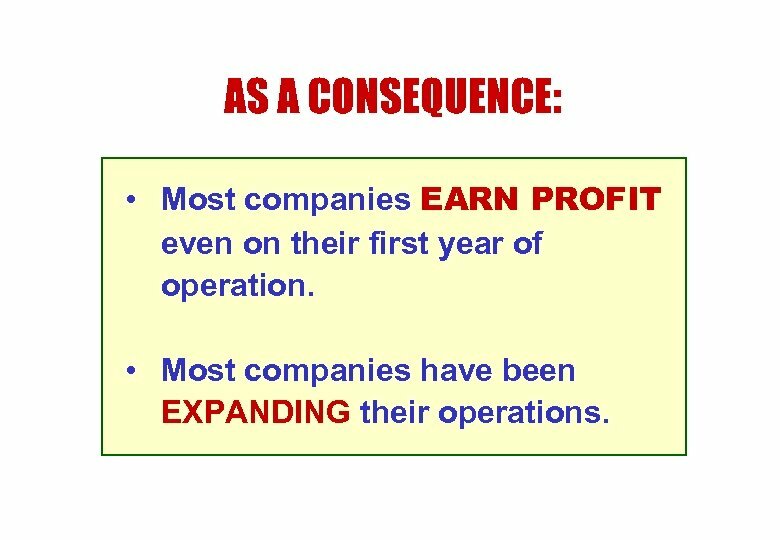 AS A CONSEQUENCE: • Most companies EARN PROFIT even on their first year of operation. 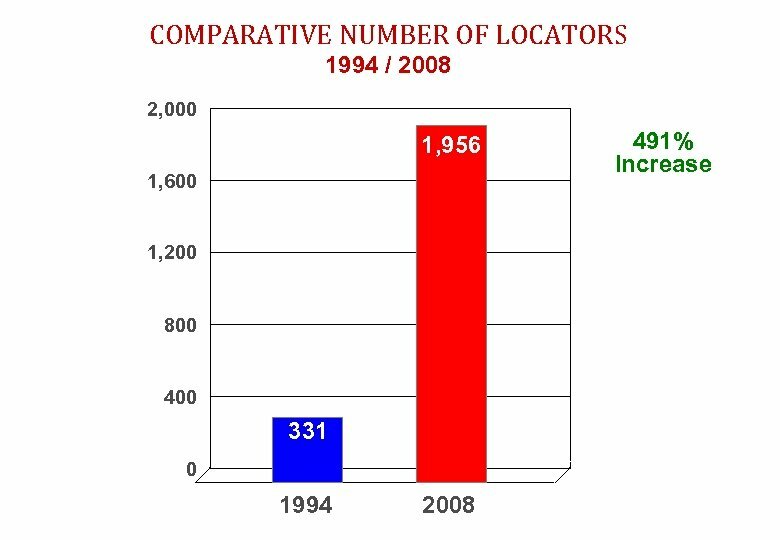 • Most companies have been EXPANDING their operations. 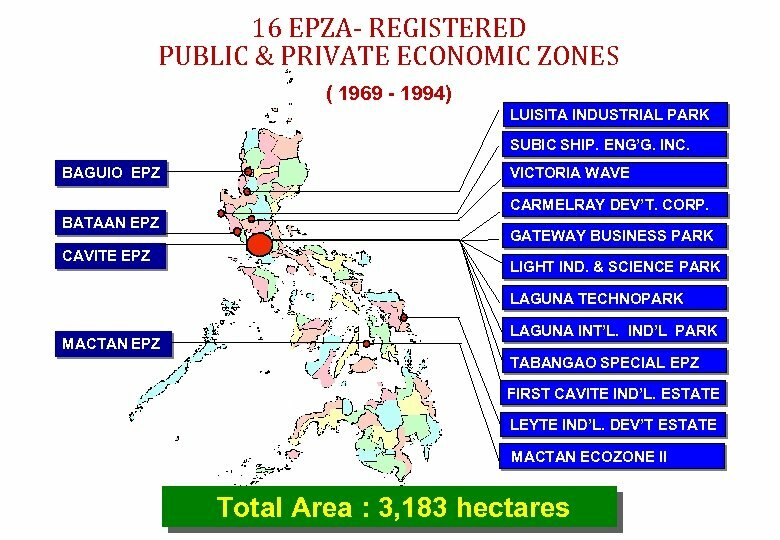 PEZA IS A ONE-STOP SHOP • Building and Occupancy Permits are issued by PEZA. 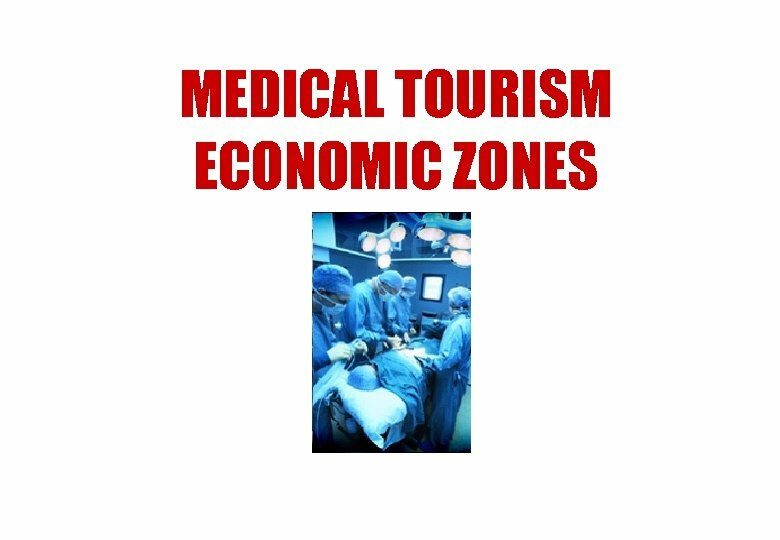 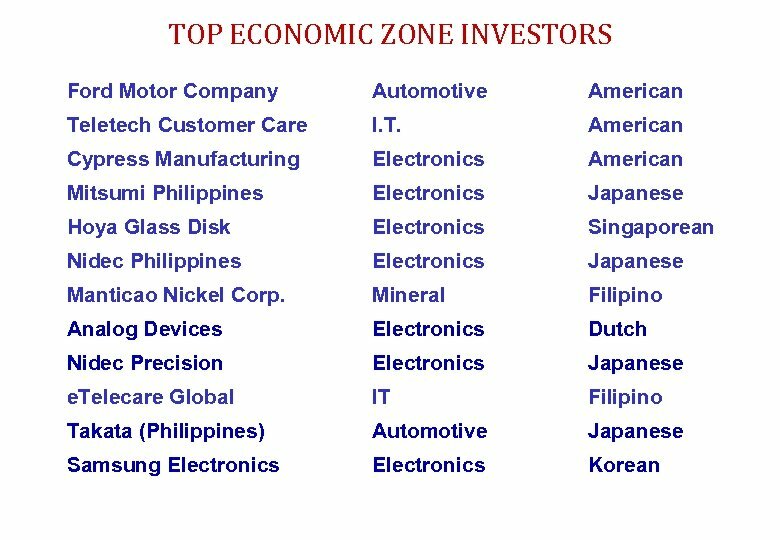 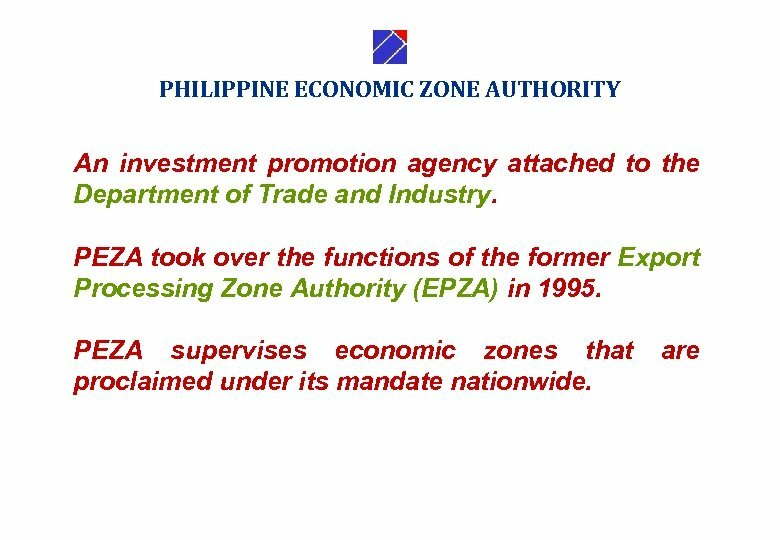 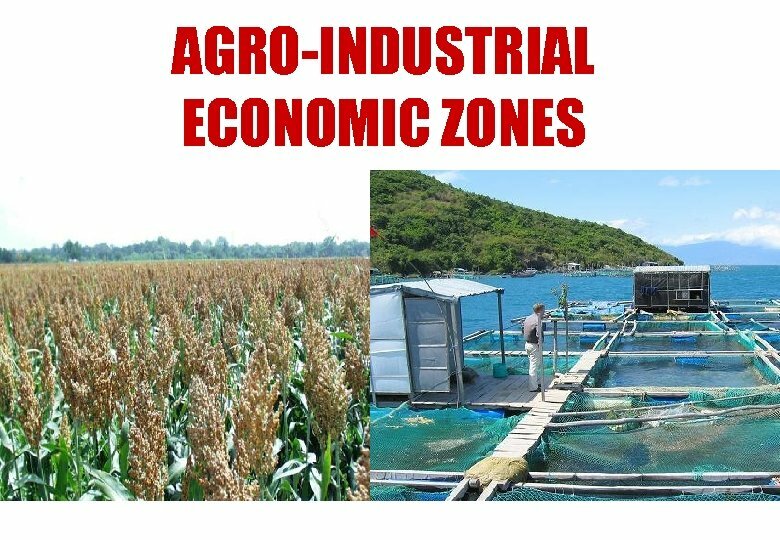 • Import and Export Permits are issued by PEZA. 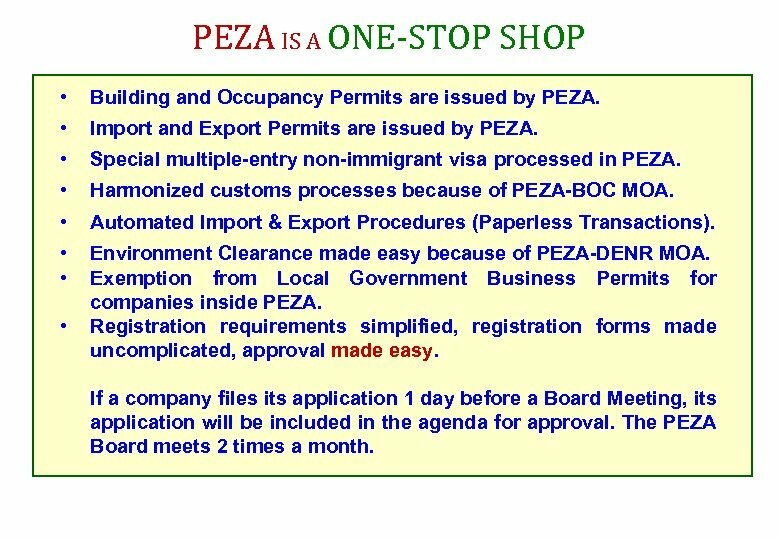 • Special multiple-entry non-immigrant visa processed in PEZA. 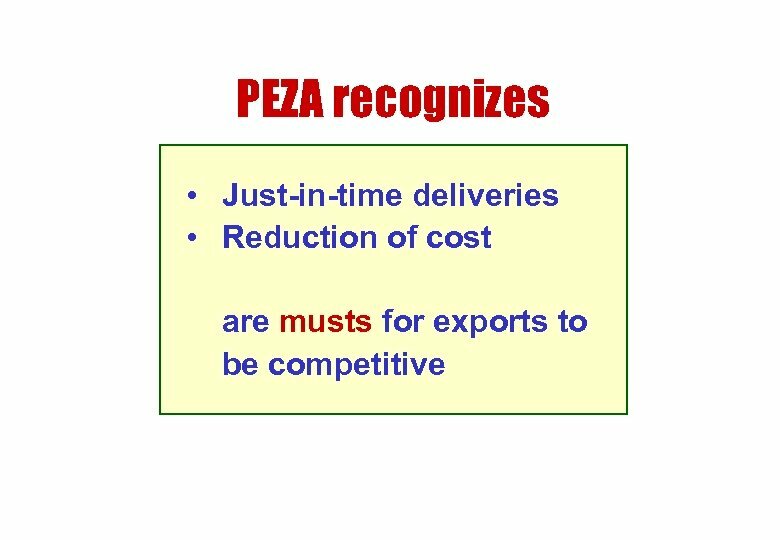 • Harmonized customs processes because of PEZA-BOC MOA. 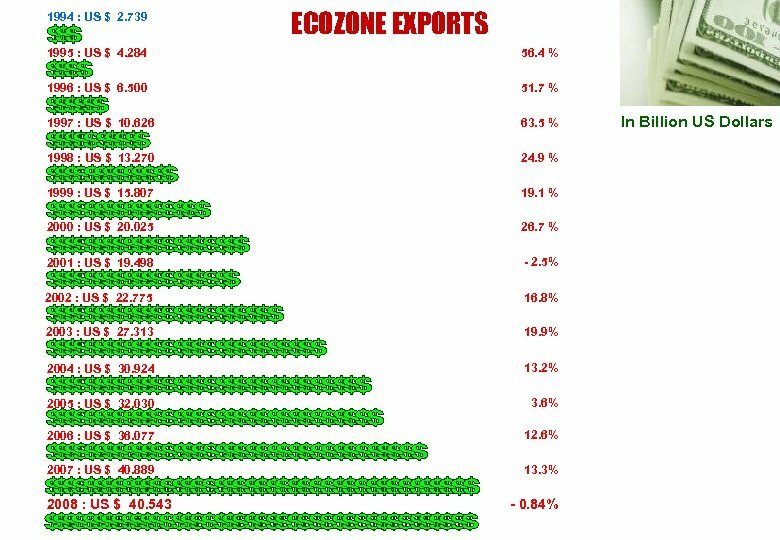 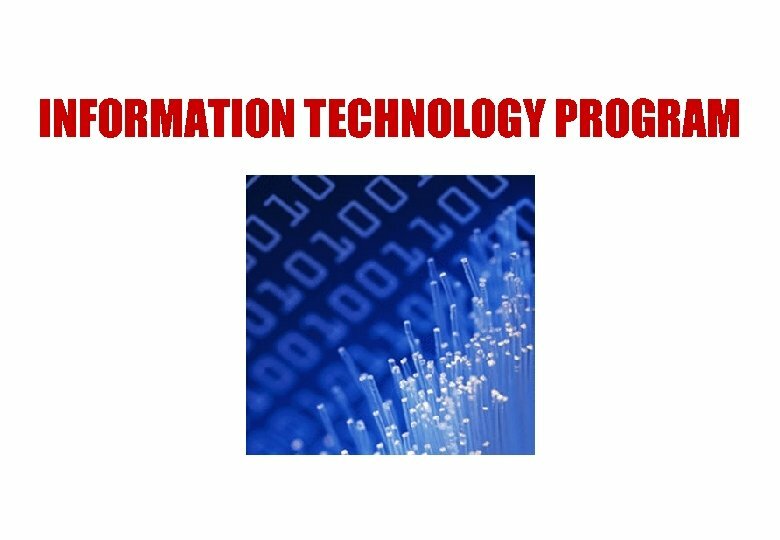 • Automated Import & Export Procedures (Paperless Transactions). 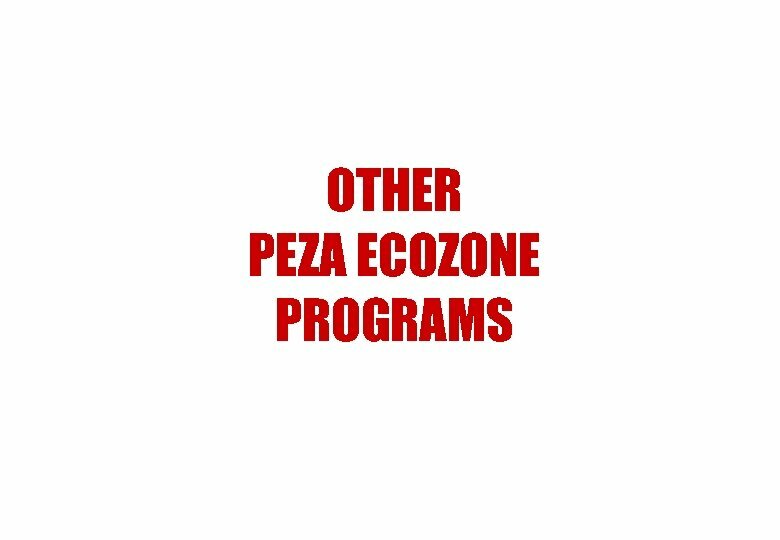 • • Environment Clearance made easy because of PEZA-DENR MOA. 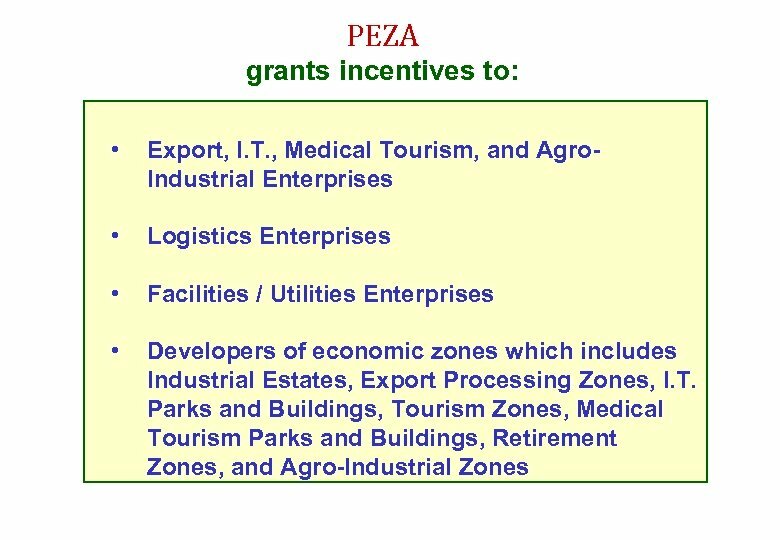 Exemption from Local Government Business Permits for companies inside PEZA. 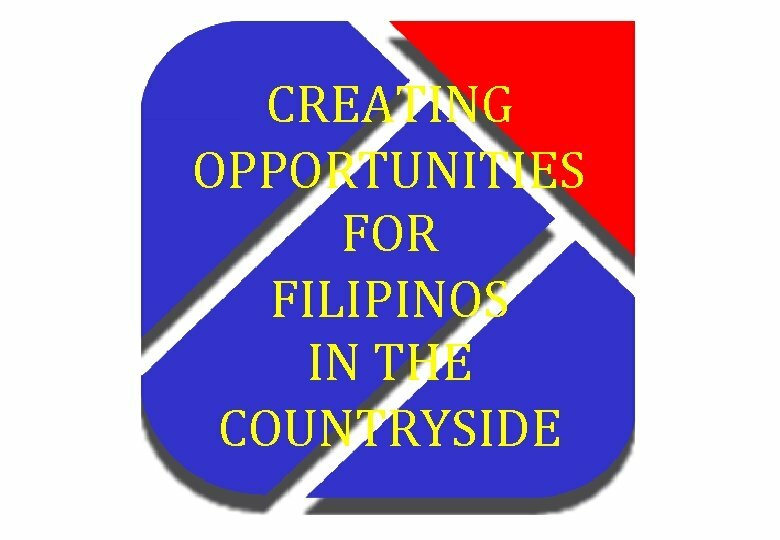 Registration requirements simplified, registration forms made uncomplicated, approval made easy. 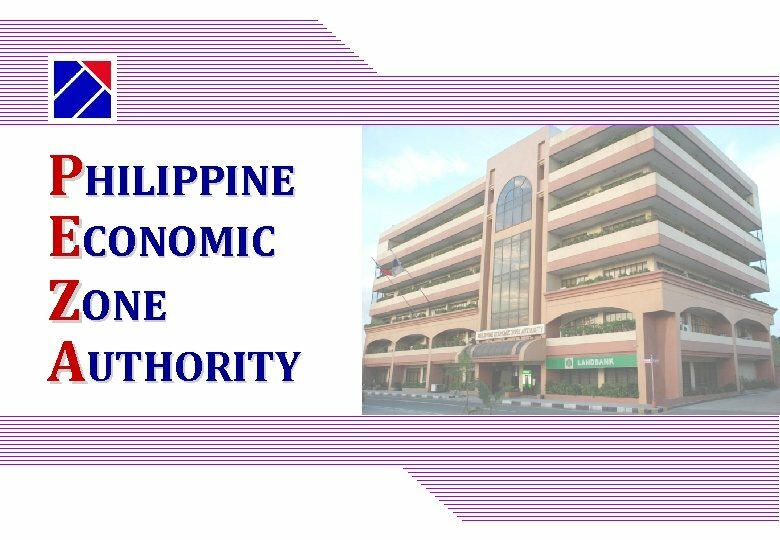 • If a company files its application 1 day before a Board Meeting, its application will be included in the agenda for approval. 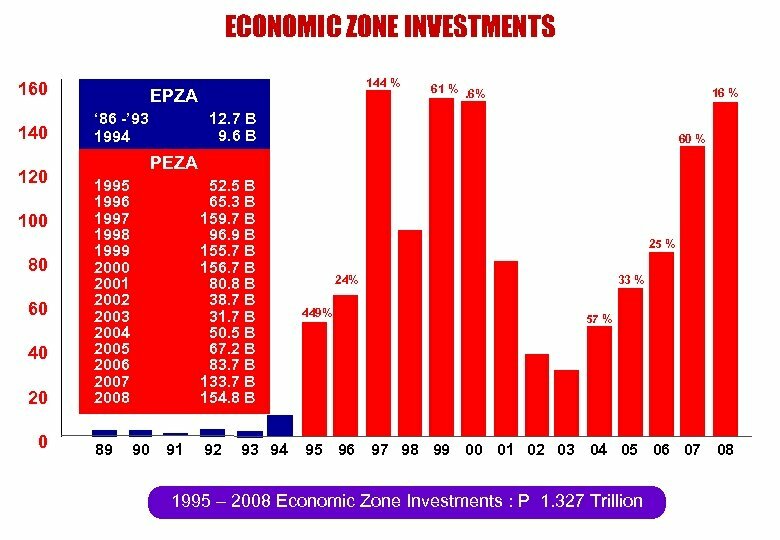 The PEZA Board meets 2 times a month. 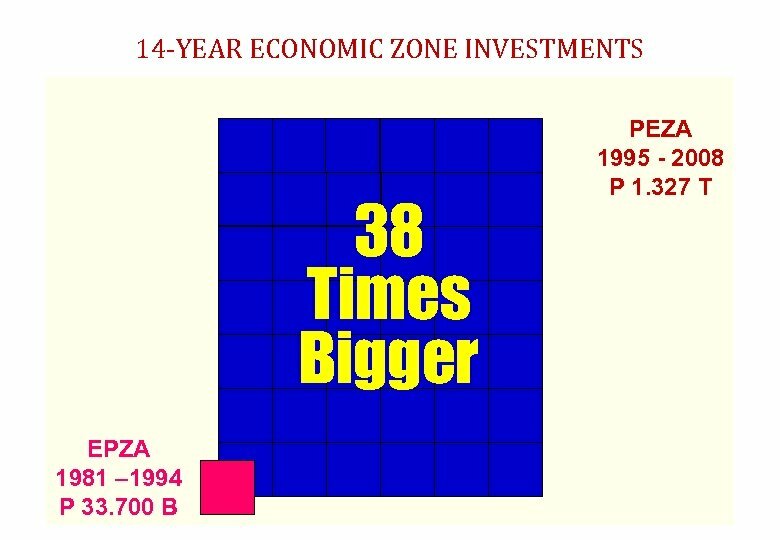 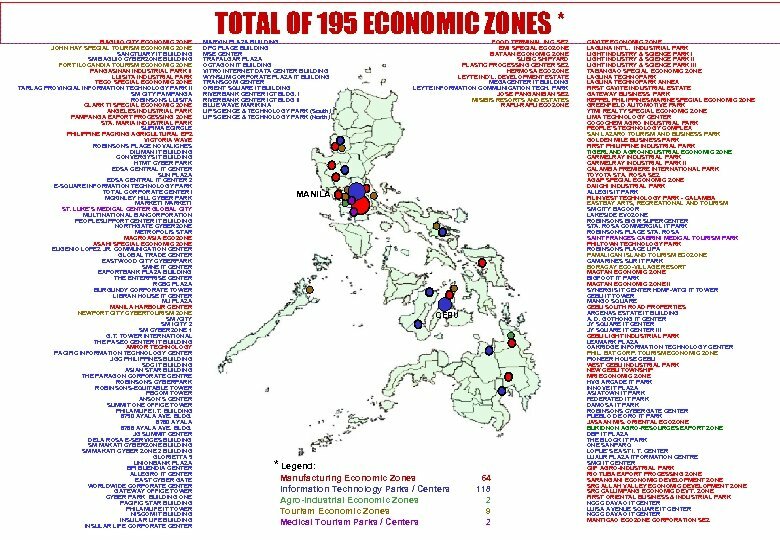 PEZA IS A “NON-STOP SHOP” • At the zones, PEZA provides 24 hours a day, 7 days a week of continuous service to locator companies. 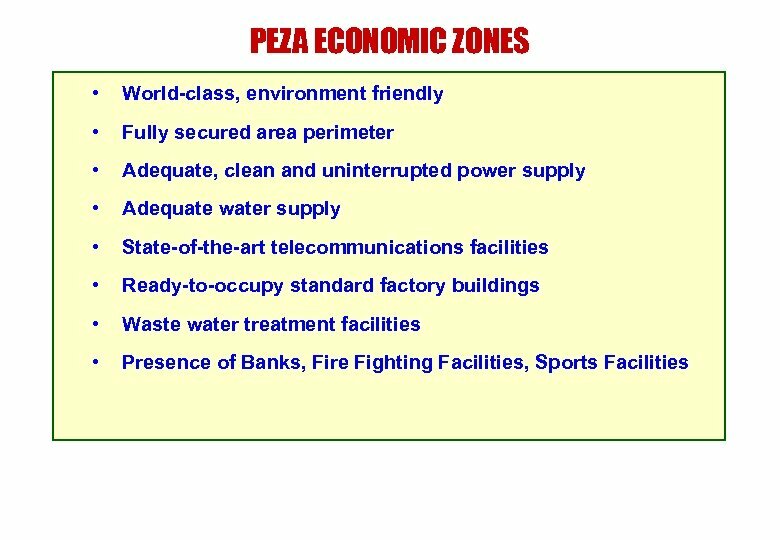 • The Director General herself and other PEZA officials are on call 24 hours a day, 7 days a week.